Challenging assumptions about how we live on the earth and protect our environment. I recently presented "A Tale of Two Cleantech Companies: A case study of what leads to a successful exit or a stunning failure" at the IMPACT 2011 Venture Summit Mid-Atlantic in Philadelphia, PA. I told the stories of Solyndra and CPower and how they failed and succeeded, respectively. I've long been concerned by the exclusiveness of the environmental movement and was especially struck by the suspicions aroused in the deep greens when the Christian right started getting interested in climate change and the environment, as if the environment was an exclusive club of left-leaning liberals. It's one of the reasons I agreed to go on Fox Business when they asked me. I didn't want to preach to the converted. I wanted to open the tent and let all the human family in. Several years ago I attended a conference hosted by one of the country's progressive environmental and cultural institutions. Invited were writers and artists, environmental activists, conservation practitioners, and a host of others. The event was held on the beautiful campus of the National Conservation Training Center in West Virginia, a venue which exists because a forward-thinking Republican from that state marshaled the resources necessary to bring it to reality. I arrived on that first evening with a sense of excitement; we were in for a few days of intense dialogue, debate, and communion among the conservation concerned. After checking into my room and making a quick tour of the grounds, I walked up to the first evening's festivities, an invocation and series of readings by some of the nation's best and most influential "nature" writers. After the reading, we all ambled up to a high point on the property for what was described as a "Summer Solstice Celebration." 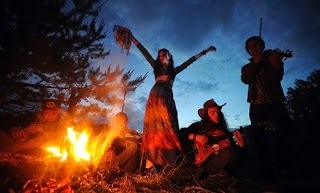 A bonfire was lit, a circle of the tribe gathered, and there was song and words of inspiration shared by the mostly white, mostly male participants, decked out in what ranged from outdoors uniforms to neo-hippy chic. This was the Birkenstock and granola crowd. As the celebration continued it spiraled into what I can only describe as pagan ritual, with a few diatribes against those who were not in attendance – the despoilers of the land. I had a sinking feeling that I didn't belong and started to move away from the crowd. This was despite the fact that I am both a writer who draws inspiration from the natural world and a professional conservation practitioner. Why did I feel like an alien in my own land, among what should have been my tribe? As I observed the group from down the hill, its music and dancing seemed to take on a decidedly Gaia-worshipping tone, as participants gyrated and "grocked" to their own brand of eco-spiritual convergence. The discomfort I felt at that celebration was that of a stranger in a strange land. I felt like an outsider, an interloper, like I didn't belong there. I almost left that evening, but the promise of four days of learning and connecting kept me from the road. My feelings were compounded by questions that began to form in my head: What if I was an outsider, observing this ritual from another, differently held worldview? How would it appear to me? "I see the pagans are at it again," said a voice off to my left. I was a good hundred yards or more from the site and hadn't noticed anyone else around me. I didn't catch this fellow's name, but there he stood shaking his head between drags on a cigarette. He looked like a federal employee; at least, he was dressed like a park ranger. "Why does every one of these gatherings have to kick off with rituals like this?" I asked. "Because we think prayer circles are for psycho-Christians," my neighbor quipped. "Imagine if we tried to start a conference like this with a prayer circle, we'd be ridiculed – or stoned." And, yet, I thought, we're comfortable with these types of displays, as if they are desirable because they are so patently other than more traditional, western religious practices. In fact, anything but rituals adopted from Judeo-Christian traditions seemed to be completely acceptable, a matter of tribal integrity. What were the religious groups in attendance thinking? And where were they? My companion for that brief, revelatory moment had disappeared, as if he were a visiting alien or a prophet in modern clothes. His words stuck with me; in fact, his words came back to me a few days later when I listened to William J. Wade, the former president of ARCO, address the group in a plenary session. He was talking about the impact of reading Barry Lopez’ Arctic Dreams as he prepared to take ARCO's top job in Alaska in the mid-eighties. Later, he got to meet Lopez and fly over the state's many natural wonders. He was a committed conservationist and was talking to us as one who had converted to the cause, like Saul on the road to Damascus, and was doing what he could to care for nature. The audience reaction to having such an alien in our midst was tepid and suspicious. How could an industry representative – one of "them" – deign to speak to "us" about appreciation for the natural world? We were the keepers of nature not the despoilers. And yet, Mr. Wade's experience was among the most genuine and authentic of the entire conference. 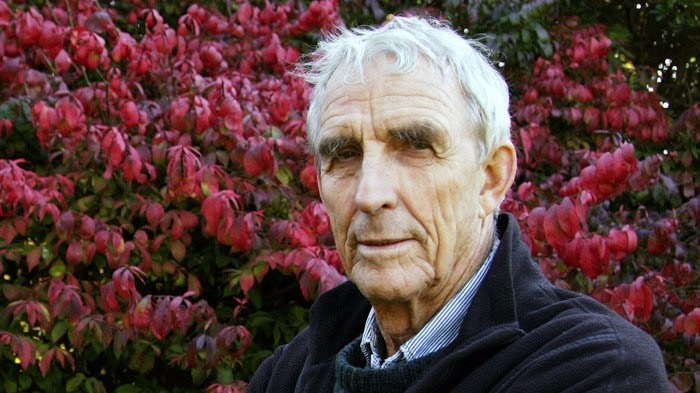 The session was followed by the next speaker, Peter Matthiessen, who fired rude salvos at Mr. Wade, the oil industry, and all conservatives who wanted to open the Arctic National Wildlife Refuge to drilling. It was an embarrassing moment, but one cheered by the majority of the crowd. I felt sick. Mr. Wade was a brave fellow who had wandered into "enemy territory" without even realizing it. How could we treat another human being this way? Where was our ethical integrity and respect for other human beings? Had we welcomed Mr. Wade to the conference only to belittle his worldview, attack his politics, and make him a whipping-boy for our gripes against industry? Where was fairness and liberal morals? Clearly these were checked at the door. I was embarrassed by my own, some of whom I considered colleagues and even friends. If an environmentalist were to be invited to speak to a conservative group or association and was attacked like this, we would most assuredly cry "foul" and decry the manners of the group at large. And yet, we were not "doing unto others as you would have them do unto you." Perhaps we should have started with a prayer circle instead of a pagan rite; perhaps then we would have remembered the manners we learned in childhood. I write this now because the environmental movement is confronted with a new "alien in our midst" - Evangelical Christians. Many environmentalists are suspicious and wary of this group's motivations and, indeed, some have questioned their sincerity in articles and the electronic print media. This is wrong. We need to apply the same sort of tolerance and respect for diversity that we espouse in our daily lives and work. We need to adapt our liberal moral tendencies to be accepting of this group as a partner. They may not join our organizations and certainly will not put aside their moral visions or worldviews to fit ours, but they have an important voice and perspective on the work ahead of us. We could learn a lot from their way of knowing this earth, despite what knee-jerk environmentalists might assume. We have not cornered the market on stewardship and care of the earth, regardless of whether you believe the earth as we know it exists through divine creation or evolutionary adaptation. The diversity of human experience of the earth can be as diverse as the fabric of life itself. We must take heed of this still, small voice in the wilderness and nurture it, welcome it into the good fight. *Seven years after this was originally posted, I heard from Mr. Wade, who had found my post. It was nice to be in touch with him and to apologize again. 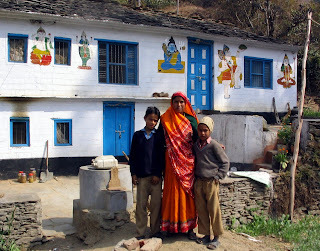 Kalyan and Anita Paul moved to the "hill country" -- Ranikhet is 1829 meters above sea level -- in 1987. Originally from Calcutta, Kalyan met his future wife and partner in social change, Anita, while both studied for a Masters in Social Work at Delhi University. After facing numerous challenges and frustrations in urban settings and with more traditional development approaches, the Pauls decided to work with mountain communities. "Kalyan always wanted to live and work with hill folks," according to a source familiar with the situation. "Anita, a Himachali who grew up in the plains, egged him on." Less than 20,000 people live in the area in and around Ranikhet, a high percentage of whom live in small hamlets and rely on natural resources for their livelihoods and sustenance. "We got a grant from the Ford Foundation to literally just 'walk around,' and that's what we did," Kalyan says. "At first the local people were skeptical; they'd check us out and see what we were doing. When they saw us walking around like them -- and we walked all over, man -- they decided, 'He's probably okay.'" That walking around gave the Pauls a clear sense of the integrated nature of the issues facing mountain people. "They live totally off of what nature provides," says Kalyan. "If there's no water, they can't grow their food. If there are no trees, there is no water. 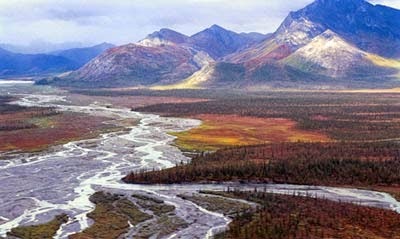 It affects everything in their lives and some leave the mountains for more urban areas. That kind of life can be hard, man." Enter Grassroots, which the Pauls founded in this area 16 years ago. They started by looking for the root causes of the mountain peoples' poverty: their lives and livelihoods are tied to the land and its natural resources. Those resources have been dwindling as a result of changes to the landscape that started under British rule and continue in the Indian forestry bureau today. Basically, the foresters promoted non-native pine plantations and eucalyptus over native broadleaf deciduous trees. Sounds like a simple thing, but it had two major impacts: the pines didn't help recharge the water sources, especially after harvesting, and the dead leaf litter was gone, which the farmers spread on their fields. Leaf litter is a natural top-soil maker. In contrast, the more acidic pine needles form a thick mat on the forest floor, preventing rainwater from seeping into the soils. You can figure out what happened next. The water table, that feeds the springs that nourishes the crops that feed the people, kept dropping. Today, at winter's end, there is very little water in the aquifer and the springs are extremely low. The Pauls, and the people who work with them, are addressing it by promoting native plant nurseries, replanting saplings from those nurseries, and developing rain water catchments to help regenerate the water supply. That would be fine as a standard environment project, but Kalyan hasn't stopped there. Grassroots determined that another factor in the forest decline was the villagers' own needs for firewood used for cooking in their homes. This use was not only denuding the forests, but was having health impacts as well: women cook with open wood fires in their homes (breathing in the smoke all day) and they have to walk farther and farther each day to find firewood, which they carry on their heads. 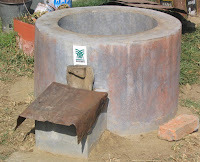 So, Grassroots introduced biogas stoves to their homes. The villagers now burn the methane generated by animal waste (cow and goat dung -- one thing of which they have plenty!) instead of firewood, and they use the slurry on their fields as an excellent fertilizer. 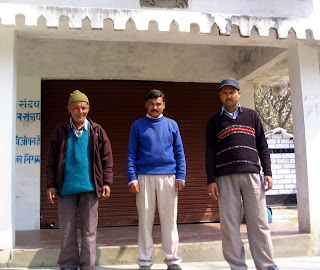 They also formed an artisan's guild to train local villagers as masons to build these stoves, thereby accomplishing three things in one: reducing forest cutting, improving the health of women, and providing jobs for at least 30 men in the area; at least 50 men have been trained as masons. Members of the Guild, who are known as "Barefoot Engineers," told me they are now installing 300 biogas units annually, 60 water pumps a year, and 400 toilets. In addition, Grassroots has organized a women's cooperative, called Umang, which means "inner strength" or "self-confidence." Umang now comprises a network of 2000 women spread over hundreds of villages and governed by reps from participating women’s "self-help" groups, with day-to-day functions managed by a group of women from the surrounding area. 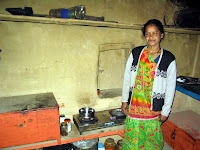 Umang’s work includes savings and credit, but also enterprise development. They produce knitwear worth more than Rs.1.5 million each year, about a third of which accrues to the women as wages, according to sources familiar with the situation. In addition, the Umang women engage in food processing, producing about 10 tons of product annually, especially pickled condiments made from local produce such as chilies, ginger, and garlic, along with fruit preserves and jams. (Their plum chutney is fantastic!) Umang also has an apiculture program that produces about 3 tons of honey every year. To better understand the impact watershed-wide, Grassroots, together with UNESCO, is conducting a study of the hydrology of the Gagas River Basin, which covers 500 square kilometers and includes 360 villages. Faisal K. Zaidi, a Post Doctoral Researcher in Hydrogeology who works with UNESCO in New Delhi, on the study says that the Gargas has been included in UNESCO's Hydrology for Environment, Life, and Policy (HELP) program. HELP, according to its website, "is creating a new approach to integrated catchment management through the creation of a framework for water law and policy experts, water resource managers and water scientists to work together on water-related problems." Zaidi says that by the end of the monsoon season this year, likely around September, they should have the first water budget for the Gagas River Basin, based upon the data collected from this study. To date, they have set up rainfall and stream flow monitoring stations in almost 20 locations, and at least a half-dozen weather monitoring stations in the basin. The true innovation in Kalyan Paul's work is the holistic approach to the root problems. I have seen plenty of economic development and environmental projects that are limited in their scope. Most projects, indeed most organizations attack one problem, and not always the root of a problem. It's often an either/or dilemma: either economic development or conservation; either livelihood or watershed protection. The Grassroots approach is integrated, holistic and more effective as a result. Not bad for a guy who started out "walking around" 20 years ago. Today is the 10th Anniversary of The Green Skeptic blog. Hard to believe I've been doing this -- albeit, not very much recently -- for 10 years. So much has changed in those ten years, not only in my life, but in the world in which we live. On 24 November 2004, I announced this blog with the following intentions: "to create a web voice that is at once environmentally concerned, while remaining skeptical about our methods of communication and action. My blog will explore current environmental issues in a pragmatic fashion, debunking environmental myths, while supporting market-based solutions that compliment actions taken both locally and globally." I certainly think I've lived up to that intention over the past ten years, both here and in my three year stint as a commentator on Fox Business with Varney & Co. While I've slacked off a bit on the number of posts in recent years -- only that first year has fewer posts than the current one -- the need for such a voice is ever more relevant and necessary today. "People often ask me why I'm skeptical and what I'm skeptical about. "Well, the answer is, I believe that skepticism is a hallmark of human nature. Without it, we are sheep. "I think we need to constantly challenge our assumptions about the way the world works or how others tell us it works. We must question even what our leaders tell us, regardless of what side of the aisle their derriere rests upon or what side of the issue they claim to represent." "I want to thank you again for reading. I hope to keep up my end of the bargain moving forward with good, informed writing about the issues, a healthy skepticism about both hyperbole and hysteria and, most of all, a respect for you, my readers." Thank you again for reading and happy anniversary! The Green Skeptic is devoted to challenging assumptions about how we live on the earth and protect our environment. We have four focus areas: clean tech innovations and investing, global climate change, entrepreneurism, and microfinance. "If you are into the green thing and dig the written word, Green Skeptic is the blog for you. Scott is passionate about conservation and has an awesome command of his craft." His "voice of informed pragmatism is very valuable." "The Gordon Gekko of Green." "Looking for the best, balanced and sourced GREEN coverage on twitter? Follow @greenskeptic Class act who knows green up and down." "The voice of common sense from a seasoned environmentalist." "Telling Stories to Change the World"
c) 2004-2014 Scott Edward Anderson, The Green Skeptic. Powered by Blogger.